You’ll float too when “IT” arrives onto 4K Ultra HD, Blu-ray™, DVD, Blu-ray™ Steelbook (exclusive to HMV), and Digital Download from Warner Bros. Home Entertainment. New Line Cinema’s blockbuster horror thriller “IT,” directed by Andy Muschietti (“Mama”), is based on the hugely popular Stephen King novel of the same name, which has been terrifying readers for decades. 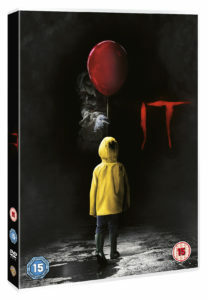 “IT” will be available on 4K Ultra HD, Blu-ray™, DVD and Blu-ray™ Steelbook from 15 January 2018. To celebrate the DVD release, we’re giving away a copy on DVD! “IT” stars Bill Skarsgård (“Allegiant,” TV’s “Hemlock Grove”) as the story’s central villain, Pennywise. An ensemble of young actors also star in the film, including Jaeden Lieberher (“Midnight Special”), Jeremy Ray Taylor (“Alvin and the Chipmunks: The Road Chip”), Sophia Lillis (“37”), Finn Wolfhard (TV’s “Stranger Things”), Wyatt Oleff (“Guardians of the Galaxy”), Chosen Jacobs (upcoming “Cops and Robbers”), Jack Dylan Grazer (“Tales of Halloween”), Nicholas Hamilton (“Captain Fantastic”) and Jackson Robert Scott, making his film debut. IT is now available on Digital Download and will be releasing ON 4K ULTRA HD, BLU-RAY™, DVD, and BLU-RAY™ STEELBOOK from 15th January. The competition ends at 23:59 on 22 January 2018. Each prize consists of an IT DVD. Competition: Win The Equalizer on DVD!